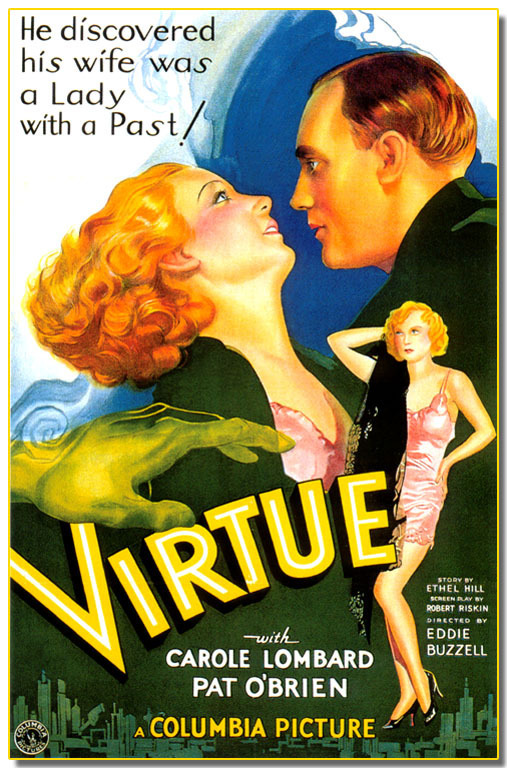 Passion, torment, fear, distrust, regret – all these are present in the poster for Virtue, a pre-Code potboiler that uses an already well-worn theme to tell its sexploitation story. The wife with an embarrassing past was already a movie staple by 1932, and the poster for Virtue is a good example of the way in which the studios – here it’s Columbia – tried to be both exploitative and responsible in their promotion of a “racy” picture. (Which concept do you think they were more interested in?) What’s interesting about this poster is its combination of disparate and not immediately complementary elements – and to modern eyes – the rather dated and slightly humorous sexual overtones. The top part of the poster is given over to what would have been regarded as a shocking tagline, one given extra emphasis by an exaggerated exclamation mark. Make no mistake, this tagline is saying, this is going to be strong stuff (and you won’t be disappointed). The euphemism is clear, but as usual it’s the kind of hyperbole that promises a lot, but which the movie itself won’t be able to provide. Then there’s the swirling blue background, something of a miasma designed to represent the turmoil the characters will find themselves battling. But as we travel down the poster, this murky miasma gives way to depictions of the two main characters, and the jarring use of orange and yellow hues to depict the passion that exists between them. A closer inspection, however, reveals something else, something revealed in their expressions. O’Brien’s character is looking at Lombard with apprehension, while Lombard returns his gaze with a concerned look of her own. It’s almost as if she’s asking herself, does he know? With this dynamic in place,it’s then that the poster decides it’s time to highlight the suggestive nature of the movie, and gives us Lombard’s exposed throat and the hint of a swelling breast. Sometimes, when you see posters from the pre-Code era, it’s interesting to see just what was regarded as “racy” or “provocative”. Here we have the unflattering sight of Lombard (sadly not provided with the best of representations) in a pink chemise with a black shawl over one shoulder, her right hand behind her head in what was no doubt intended to be a sultry pose reflecting the kind of “past” O’Brien doesn’t know about. It’s the pose of someone with a disreputable character, but too awkwardly designed and executed to have quite the effect required. More startling is the spectral hand reaching out as if attempting to touch Lombard’s right breast, or perhaps to clutch at the more sultry embodiment further to the right. It’s a clumsy expression of the past life that’s about to catch up with her, and would be better off on the poster for a Forties’ horror movie. And then there’s the movie’s title, highlighted in blatant yellow, and a counterpoint to the rest of the imagery – as well as being something of a challenge. Virtue? you might ask? Really? The rest of the poster, with its strong yet ugly shade of green used as a backdrop for the stars’ names and an unnecessary city landscape, is perfunctory if a little brutal. Judged as a whole, though, this is a poster that works surprisingly well, its contrasting colour scheme and pictorial stylings somehow coming together to make an effective piece of advertising. You could argue that it’s not pretty, and you could argue that it’s too inconsistent in its composition, but while all that may be true, what can be said with absolute authority is that this is a poster that captures the attention and has a lot to offer – and in spite of its diverse components.